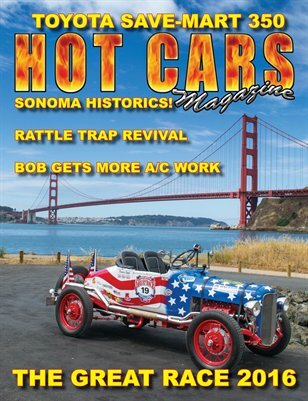 In this issue we take you to the always fun Rattle Trap Revival in Valley Ford, CA to see some cool hot rods. We visit the Sonoma Historics and check out some great vintage car racing. A few months later we’re back in Sonoma for NASCAR racing. Our project car continues with the Vintage Air insulation in our ‘30 Coupe. Then 14 pages of the GREAT RACE!! Including a gorgeous Auburn in our very special centerfold.